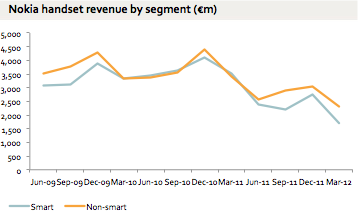 You really can’t claim to understand the trouble Nokia is in unless you look at BOTH of the lines on this chart. Nokia has a clear story for the smart business. You might or might not believe it, but it is there and it is coherent. But the non-smart story is just as important, and Nokia doesn’t really have a story there at all. This is the land of $40 quad-SIM handsets from Konka and $70 shanzhai Androids, and S40 is seriously challenged - down 30% from March 2010 to March 2012 in a growing market. And nothing Elop should or shouldn’t have said would make a blind bit of difference to that.